Most news venues concentrate on only the negatives in life and have yet to give President Trump his fair credit in regards to what he has done with the country up until now. For one thing, he has actually worked to keep his campaign promises which can’t be said of many other elected candidates to date. His election rallies drew crowds yet the democrats refused to see the obvious as evidenced by their election night tears and screams of surprise. Yet, in spite of the turnout to elect a president that kept promises, the Midterms seem to be rather low-key in interest which makes you wonder why the winner of 2016 feel they can be so complacent. You can’t have a ‘red wave’ if voters are going to piddle around and figure someone else can worry about it. 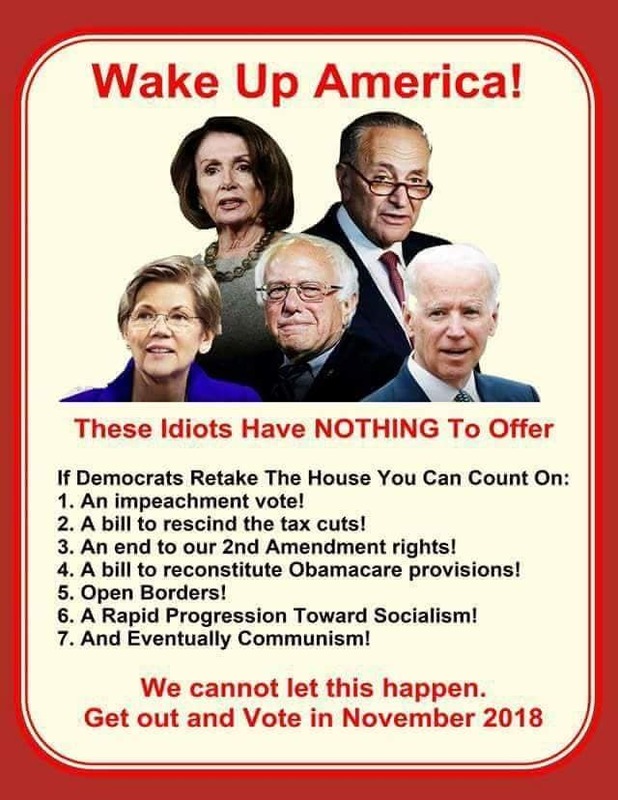 After all, would it really make that much difference if the democrats take over the House. Attractions at a Parish Fair? I spent a few years chairing a parish’s annual fair and had to make determinations about what booths would work and what would not. One evening, being rather tired from working on a current one, my husband and I came up with a (totally fictional) list of prospective booths. 2. The Tattoo Booth. The person interested in sponsoring this booth was very sincere but, sadly, untalented. We didn’t feel there would be much call for stick figure tattoos. He assured us that they were of the saints but his samples all looked alike to us. 3. The Healing Booth. This booth became obsolete as soon as we turned down the body piercing and tattoo booth. 4. Foods from the Earth Booth. We understand some people feel earthworms are edible but we decided to go with beef hamburgers this time around. 5. Madam Zablonghini’s Booth. Madame offered us a discount on her crystal ball service. Unfortunately, the huge radio tower on the church premises interfered with her reception. 6. Mud Wrestling Booth. This booth was canceled due to lack of interest. Go figure. 7. Tofu on a Stick Booth. The sponsors for this booth canceled out when we suggested for sales appeal they either dip them in chocolate or deep fry them. 8. Martin Luther Discount Indulgence Booth. The booth was banned in this diocese. The sponsors were a bit dismayed as they planned to give a free 60-day indulgence with every purchase. 9. Health Update Booth. This would have been the place to catch up on your children’s vaccines while they enjoyed the Fair. Seems a large group of children have threatened to block the entrance when the Shots on Wheels tried to get in the parking lot. 10. Night Cap Booth. This booth planned to serve free servings of Surge Soda, the pop with twice the sugar and 90 percent caffeine with all the refills you want for children ten and under. Seems parental disapproval was one hundred percent. We live in a crazy world . . . Prepare for it! Everyone should take 5 minutes to read this. It may save your life or a loved one’s life. In daylight hours, refresh yourself of these things to do in an emergency situation… This is for you, and for you to share with your wife, your children, & everyone you know. It never hurts to be careful in this crazy world we live in. 1. Tip from Tae Kwon Do :The elbow is the strongest point on your body. If you are close enough to use it, do! 2. Learned this from a tourist guide. If a robber asks for your wallet and/or purse, DO NOT HAND IT TO HIM. Toss it away from you… Chances are that he is more interested in your wallet and/or purse than you, and he will go for the wallet/purse. LOCK THE DOORS AND LEAVE..
DO NOT DRIVE OFF! Instead gun the engine and speed into anything, wrecking the car. Your Air Bag will save you. If the person is in the back seat they will get the worst of it. As soon as the car crashes bail out and run. It is better than having them find your body in a remote location. A.) Be aware:look around you, look into your car, at the passenger side floor ,and in the back seat. B.) If you are parked next to a big van, enter your car from the passenger door. open the door..’ The lady then said that it sounded like the baby had crawled near a window, and she was worried that it would crawl to the street and get run over. The policeman said, ‘We already have a unit on the way, whatever you do, DO NOT open the door.’ He told her that they think a serial killer has a baby’s cry recorded and uses it to coax women out of their homes thinking that someone dropped off a baby.. He said they have not verified it, but have had several calls by women saying that they hear baby’s cries outside their doors when they’re home alone at night. 10. Water scam! If you wake up in the middle of the night to hear all your taps outside running or what you think is a burst pipe, DO NOT GO OUT TO INVESTIGATE! These people turn on all your outside taps full blast so that you will go out to investigate and then attack.